Some consider this roughly 49-foot-tall (15 meters) Buddha statue housed in Wat Si Chum to be the most beautiful Buddha statue in Thailand. Its setting is striking: The enormous effigy sits inside a confining chamber, where it peers through a narrow opening facing east. Its home once had a roof but that collapsed, leaving the Buddha to sit serenely beneath the open sky. 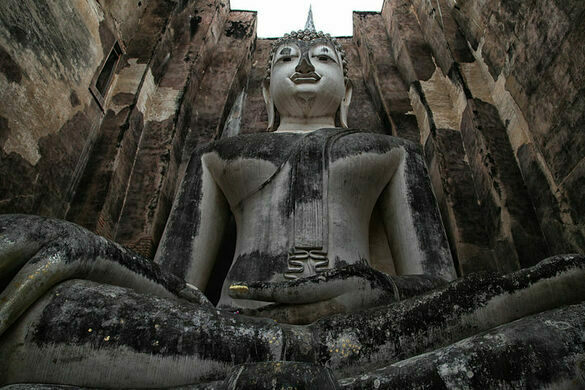 The name Phra Achana is mentioned in an inscription recovered in the archaeological site Wat Si Chum, and it means “Buddha who is not frightened.” Legend has it that a contingent of the Burmese Army, while invading Sukhothai, fled upon seeing the statue. Phra Achana goes also by another name, Phra Poot Dai, meaning “speaking Buddha.” This name refers to an event that happened in the 16th century, when Sukhothai was the capital of one of the fiefdoms controlling parts of Siam. On that occasion, the statue appeared to give a motivational speech to the Sukhothai army. This happened because a staircase beside the Buddha statue leads to a small recess in the wall, allowing a person to make a speech unseen by a crowd gathered in front of the statue, the acoustics making it seem as though the statue itself is speaking. 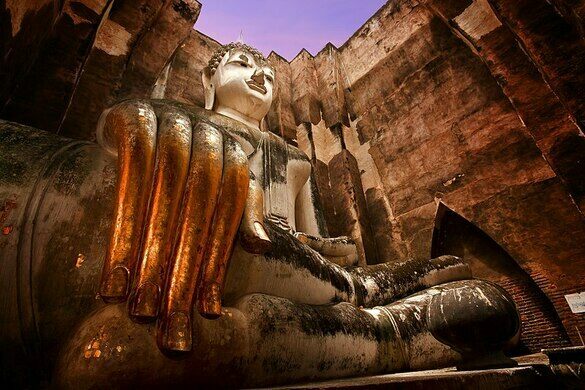 Legends aside, it is not difficult to see how Phra Achana must have induced a sense of awe in visitors. Phra Achana sits in the Bhumisparsha mudra, a symbolic gesture usually referred to as “touching the earth,” according to which the Buddha’s right hand rests on his right knee, palm inward, with the fingers relaxed and pointing down, and the left hand rests open, upward, in his lap. Bhumisparsha mudra represents the moment Buddha achieved enlightenment and the Earth stood witness. The serene expression in Phra Achana’s eyes points at the moment Buddha defeated demonic temptation. Devout Buddhists place gold leaf on the delicately sculpted fingers of Phra Achana when they make merit. Phra Achana is housed in Wat Si Chum, which is located in the northern section of Sukhothai Historical Park. Thailand's distressed elephants find peace at this Chiang Mai sanctuary. One of the largest Marian shrines on the West Coast stands rather unexpectedly in Silicon Valley.